Two low voltage, low power zeners are used to control electronically the level of an audio signal. The attenuation range is from 6 to 58dB for an input current from 0.042 to 77 mA corresponding to a control voltage from 2.7 to 7.5V. 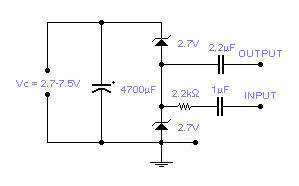 If control voltage is limited to 5V, the attenuation is around 30dB at a control current of 2mA. This is not an HiFi attenuator but might come useful as a general purpose audio attenuator.